The Tunnel & DNS at Node Jypels might be down for a bit, while it gets moved over to a more Powerful / Efficient server. OK Tunnel and DNS is back online and moved over to the new ESXi server. OSPF should start routing to it again shortly. I'll load higher res/better photos at a later stage for you guys. Tunnel server's OSPF is back online. Getting the tunnel to come back up was tricky. Default script tests if 172.18.1.5 is pingable, and if it is doesnt restart the tunnel. So had to set it to the tunnel ip on Gravity side to fix that. Will have to do that later for all the other places where we run tunnels too, Callisto and Hyperlink, and later CapeFlyer. has the ip stayed the same for the server? Yeah its still the same. 1) 6 x 105Ah Deep Cycle batteries. 3) Cisco MDS 16 Port fiber switch - need to move my servers over to this still. 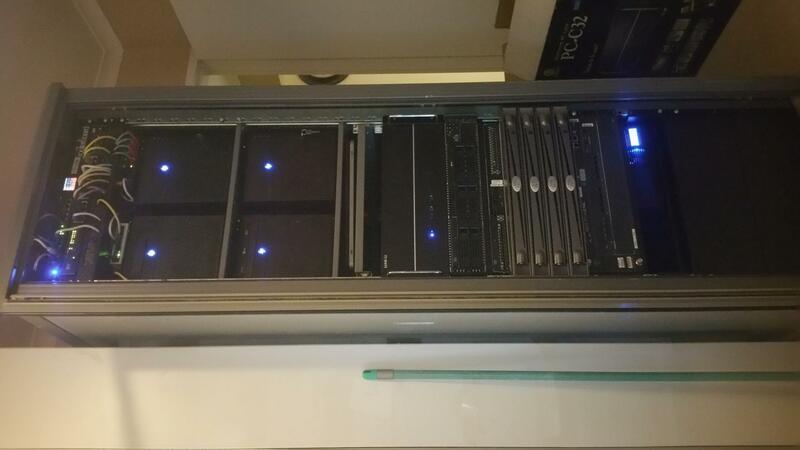 4) 4 x 1U Centera Nodes - These are awesome file servers with fiber built in. 5) 1 x 1U Intel Xeon server - was used for Tunnel and DNS server - going to be VM testing machine from now on. 7) 1 x Custom built 4U server in Lian Li chassis - This is an dedicated ESXi server and the new home of the tunnel and DNS. Soon to host audi aswell. Specs: Intel haswell i7 4790 , 32GB ddr3 1600 ram, 2 x SSD's and 1 x WD velociRaptor. 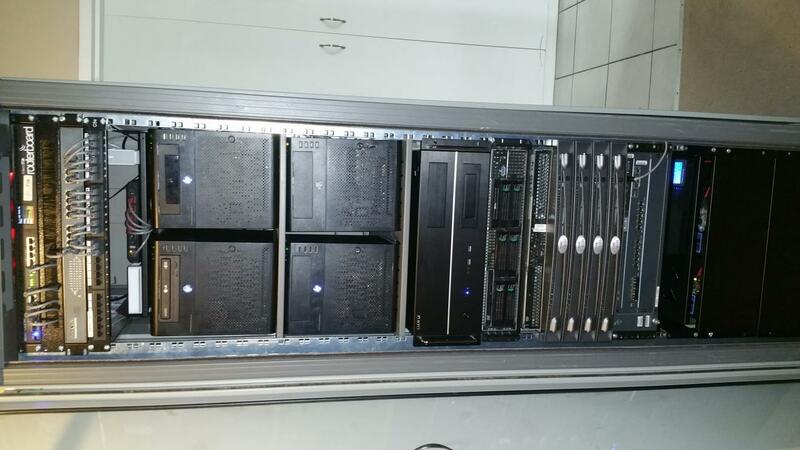 9) 4 x HP N54L microservers with 16GB ram each. This is what makes Inm0 tick. 10) Billion VDSL router - this is tucked between the top 2 microservers and supplies Inm0 with 20mbps VDSL. 11) Mikrotik RB951G - used for PPTP and private DHCP. 12) Ubiquity 5 port tough switch - used to supply power to my wug links. 14) Mikrotik RB2011 - used as core wug router. I can move the thread to the jolly if you guys want to talk more details, but please be aware that this is in the open forum. don't give him more ideas! Haha wish I could but my rack is so full. Had to take out an 1U server to fit everything! We hit a little Snag when we moved the Hardware based Tunnel over to the ESXi virtual machine. Seemed to make everything unstable. We have moved back to the Xeon based Tunnel that will offer a much more stable experience for everyone. Special thanks to Tinuva for all the work he has put in on this. Will most probably be moving from Afrihost to a new ISP tomorrow. Currently on 20mbps VDSL Business Uncapped / Unshaped from Afrihost and Speed / Latency has been terrible for a week or so now. Will update once move is complete. 2) Tunnel is still down - Hardware tunnel seems to be having a problem, will redeploy a fresh server for this in the next couple of days. 4) Afrihost seems better this week, will wait until end off June to see if the network stays stable, else we will be moving ISP's. 5) Server cabinet is a mess atm - will have to redo all network cables at some point else my OCD will kill me. 1) Did a complete server cabinet overhaul last night. Special thanks to Wacko and Thaviper for the help. Everything is so much neater now and easier to locate a problem. 2) WugTube will be live probably somewhere in the weekend - will give Wuggers a dedicated place to share videos and photos. 3) Afrihost seems super stable the past couple of days. 4) The dedicated DNS has seemed to make a massive diffrence in the surrounding areas from feedback received.